New Jersey tennis players are finding it easier to get fit for tennis gear, and anyone around the Mercer County Park tennis courts this week is learning why. 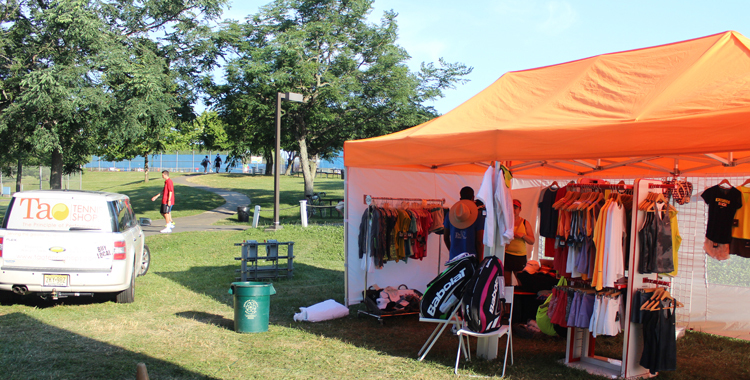 Tao Tennis Shops, a family-owned tennis pro shop with two locations in New Jersey, has been taking its shop on the road this summer to provide performance gear, stringing and more to players and fans onsite. They kicked off their summer tour with pop-up shop at Mercer County Park during the US Open National Playoffs in June, and came back again to Mercer this week to service the historic and popular Cryan Tournament. It’s just another way that Gerald and Brooke Sarmiento keep up with New Jersey’s active tennis community. “We have always been very service-oriented people, and so our pro shops are designed to reflect that ideal,” says Brooke, a New York fashion designer whose former work included dressing celebrities, including Beyonce. Brooke handles the buying of apparel, footwear and accessories, which means that Tao Tennis Shops often has the newest and hottest apparel around. Brooke’s husband, Gerald, handles the technologies end, including racquets, strings and accessories. By focusing on the elements of performance (the right racquet, on-point customization, accurate stringing, well-fitted footwear and apparel), Tao Tennis Shops aims to help their clients achieve optimum performance. By bringing the Tao Pop-up Shops to events in the area, Brooke and Gerald are hoping to spread the word. The success of Tao Tennis Shops was evident in early July, when Gerald and his stringing team traveled to Newport, R.I. for 10 days to service the ATP Tennis Hall of Fame Championships, a pro tour event that attracts some of the world’s top players. Gerald serviced more than 250 racquets for pros that year, providing not only stringing, but customization work. He’s now back in New Jersey, providing the same world class service for local players. For more information on Tao Tennis Shops and their “Pop-Up” schedule, check them out at facebook.com/taotennisshops.